Started to work with Neutron since IceHouse. There was some important HA and scalability issues in neutron at that time. HA problems were mostly related to Routers and DNSMASQ resources. Neutron used to be hard to scale. An important workaround was to implement networks with much memory capacity. It makes you to spend more, but it’s better than a failure that can cost more. don’t you think? Routers weren’t configured in HA by default in IceHouse’s Neutron. It was solved adding pieces of software from other projects. It wasn’t perfect, took some time (4-5 minutes) to switch all affected routers over to the other network node. 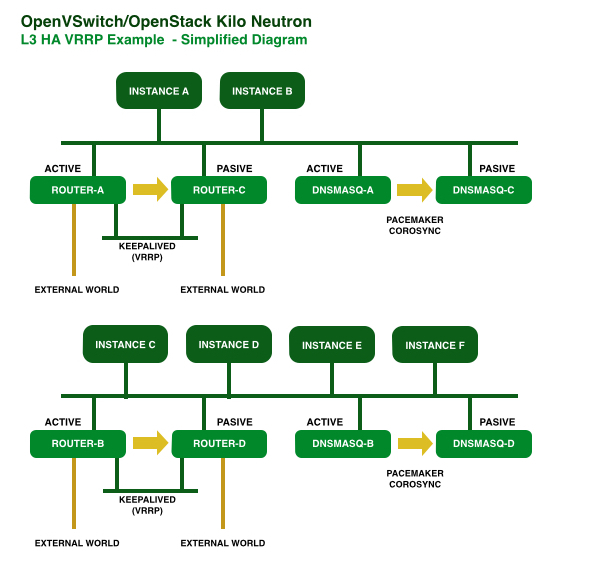 Starting at Juno, you would be able to implement VRRP to bring L3 HA to virtual routers. 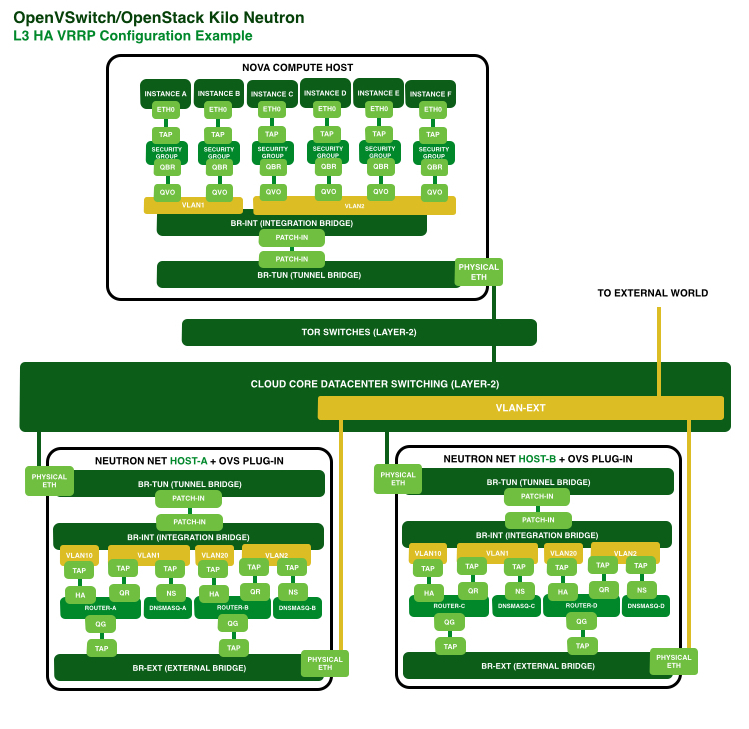 Honestly, It’s better switch over to Kilo, the solution is much better and easy to implement. Also, there is an extreme improvement in throughput that helps to lower cost in network nodes’ hardware. Routers fail over in just seconds, most of the cases users don’t get they are going through a failure. You will notice there is an additional internal VLAN between routers for VRRP (KeepAlived). Next picture simplify the above in order to understand better what I mean. A downside is DNMASQ services (i.e. DHCP) are not easily deployed yet to bring the same HA level as routers. You will need to add projects like pacemaker and corosync to these resources.